Manipur the jeweled land is perhaps the least explored state of North East India by tourists and travelers. Its not about spectacular monuments, glitzy development, picture perfect landscapes but experiencing the subtle and the surreal. When the forgotten pieces of history come together to weave a story of chivalry of the men and women of the land, like me you will also wonder whether the modern history of India would have charted a different course had we integrated the stories of North East India into the mainstream and given them a wider mention in our history books. While planning a trip to North East, do include Manipur as well and explore the jewels that the state hold close to its bosom. Here are the must do’s in a Manipur Trip Itinerary. November 21st to 30th during Sangai Festival. The region is blessed with temperate weather and it is comfortable round the year except during monsoon months of June to August. Plan a 3 -4 day Itinerary to get a flavour of the place. Ima Keithel or Mother’s Market in Imphal, Manipur is the second largest Women Run Market in the world. A trip to the market is must, to see, to interact, to shop and to understand what it takes to churn out sporting heroines who make the nation proud. There is a unique sense of leveling in the market, it does not matter what you sell, how you sell, mutual sisterhood and support seem to keep them going. Wartime History in Imphal and the neighboring areas. Manipur is immortalized in World War History since The Battle of Imphal held on its soil between the British and the Japanese was a turning point in World War II. It is perhaps the only war where Indians fought on either side and the Indian National Army managed to get in and hoist the flag on Indian Soil in Moirang, Manipur. The cemetries, the battle fields, the memorials bear testimony to a not so remembered piece of history. Blue Loktak Lake and Floating Phumdis is a mesmerising sight that you can see from the airplane itself. This is only lake where the “Phumdi”- mass of vegetation floats around with the with the wind and current. One of the Phumdis houses the world’s only floating national park Keibul Lamjao. The majestic Sangai Deer which is also the state animal of Manipur can be sighted in Keibul Lamjao if you are lucky. Kangla or the Dry Land is the ancient capital of the Meitei rulers since 33AD. All that remains is the ruined fort in the heart of the city of Imphal which was handed over to the Manipuris in 2004 by the Central Govt of India. Over the 275 acres of green there is the fort, the museum, the ancient temples of Pakhanba and Govindajee, the crematoriums of the kings, bungalows of the British generals and the quietly flowing moat which once protected from the external attacks. 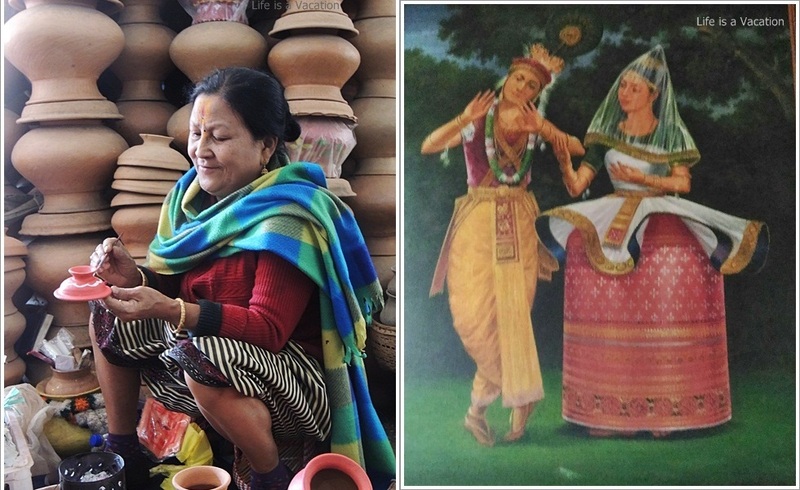 The Meiteis of Manipur were originally followers of Sanamahism until the 18th century when they converted to Vaishnavism en mass under royal directive. Over the years they seemed to have settled down to the middle path of following both. The devout Manipuri is proud of the Govindajee temple. The soulful kirtan in the evenings tugs at the heart strings. Black Rice and Red Hot Chilly really make the otherwise fish centric Manipuri Cuisine unique. The Red Hot U-Morok is the signature chilly of Manipur which adds the special zing to the food and what better than the sweet dessert made from Black Rice or Chak Hao that is available only in Manipur. Digging into a Meitei Thali is a must, complete with the Singju, Iromba and Thongba. Walk across to Tamu in Myanmar through Moreh in Manipur, located about 2 hours way from Imphal. If the trial runs are successful, then maybe a bus ride will connect Imphal to Mandalay. Myanmar is not about ticking a foreign country off the Travel List but a mystical experience where time stands still. Take a walk in the bazaar, sit in contemplation in the monastery and take a bite into the Myanmarese Cuisine. Explore the myriad culture through the art forms. Rabindra Nath was immensely impressed with the Manipuri Dance and most of his dance dramas are depicted through this art form. It is one of the 8 classical dance forms of India which is an appreciation of love for Krishna as in Raas Leela. Then there is the hand to hand wrestling of dhoti clad Manipuri men, hand made pottery, bamboo basketry and of course the making of hand made shawls. Lastly, catch up on a Shumang Lila performance which is an excellent stand up conversational theatre mostly on contemporary issues. Imphal the capital of Manipur is connected by flight to Delhi, Kolkata and Guwahati. Nearest railhead is in Dimapur which is 7 hours away. It is about 3-4 hours from Kohima(capital of Nagaland) if you are planning a trip across multiple states in the North East. Day 3– Morning 7am visit to Govindajee Temple followed by a visit to the Royal Cemetry, Kangla Fort, Shahid Minar, Polo Ground. Post Lunch visit the INA Museum and Red Hill and then reach Loktak Lake. You can rush to Keibul Lamjao National Park 10 minutes away at dusk. Alternatively, stay at Sendra Resort in Loktak Lake. Day 4– Visit the National Park to see the Sangai Deer. Depart in the afternoon or take a trip to Andro Village which has the entire culture of Manipur on Display. Looking for transport only then contact Bobo Cabs – 9863285885. They are very punctual and is often the choice of state guests as well as celebrities. Interesting and informative.Was it easy getting the permits? 🙂 Club it with Nagaland and better still between 29th November and 3rd December to cover Sangai Festival in Imphal and Hornbill Festival in Kohima. whoa..this must be an exciting place..loved the color and vibe in the post..must bookmark Manipur. Great post and pictures, Sangeeta. Happy New Year. What a thoroughly detailed post wonderfully done.